You work hard to create a marketing strategy that helps your customers solve their problems. Each of your marketing channels needs a consistent voice and imagery that builds brand equity. You need to centralize your brand’s communication efforts while at the same time allowing local marketers to optimize their marketing materials for everyday use. How does it happen? With online brand management. A brand management solution helps to protect your brand’s identity, manage your brand’s assets, and improve your marketing ROI. 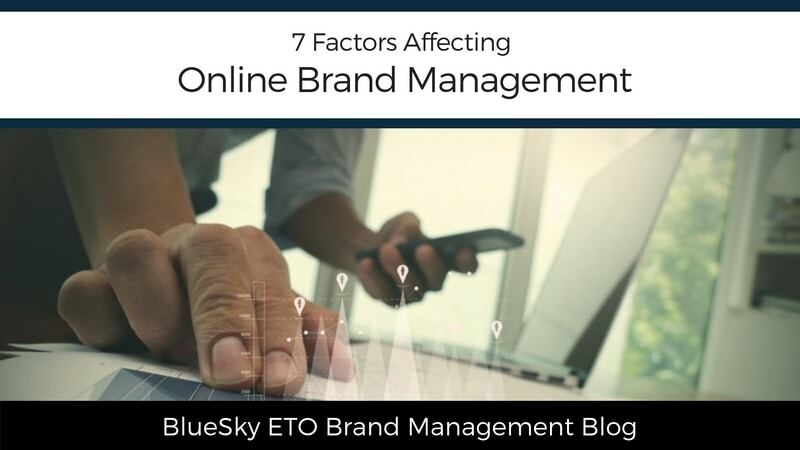 Here are seven factors that affect online brand management. You’ll discover how you can react to each to better manage your marketing. Is your brand compliant and consistent across all your marketing channels or are you having an identity crisis? Compliance and consistency are two of the primary factors affecting online brand management. To get them in order is to establish a solid foundation for your entire marketing strategy. A brand management solution can help control your brand’s identity and empower local marketers with the freedom and creativity they need to produce their own approved marketing materials. Many businesses have brand compliance guidelines, but they don’t take the time to enforce them. That’s a problem. By enforcing these guidelines via a brand management solution, you’ll be sure your marketing materials maintain your brand identity. Just upload the guidelines to a Brand Marketing Center where all your authorized users can access them. You can also include electronic files like images, videos, advertising templates, email signatures, business card templates, and much more. Any time you want to update your brand compliance guidelines—or any other file for that matter—upload the new file and it replaces the old. Think of the time savings when you don’t have to email files when there’s a new version or update. The American Marketing Association believes every marketing department needs a hub where they can manage their brand. This allows you to achieve compliance and consistency. When you present your brand consistently, you can increase your revenue by an average of almost 25%. This also allows you to eliminate any confusion in the marketplace. Consider the mixed signals you’re sending if you’re marketing a franchise with a logo that looks different from one location to the next. That’s a high-level example, but any sort of brand confusion (inconsistent advertising, wording, imagery, etc.) leads to mistrust. Almost half of Americans find brands and companies less trustworthy today than they did 20 years ago. A brand management solution can help you maintain both consistency and trust. The investment you make in online brand management software is small compared to the return you’ll receive. The ultimate factor affecting online brand management is proving your return on investment. In fact, 40% of marketers say proving their marketing ROI is their top challenge. Can you prove yours? With the proper, customized brand management solution in place, you can not only confirm your ROI with robust reporting software, but you can also increase it and meet your marketing goals. Expand your reach and sales. According to the Harvard Business Review, marketing spending could be $2.1 trillion in 2019. But is all that money well spent? Brand management software provides the results to help you answer these questions and many others. It’s estimated that national brands and franchisors will increase their local marketing spending by more than $17 billion before 2023. With the trend toward hyperlocal marketing, it’s easy to understand why. Many customers only care about what’s happening where they live. So brands need to understand the different languages and cultures of their local customers. When your local marketers create and update marketing materials tailored for their local audiences, those materials become more relevant. That leads to an increased return. Meanwhile, local patrons feel more of an association or rapport with the local business. When McDonald’s saw their profits fall two quarters in a row, they turned to localization as part of the remedy. They had already tried their hand at localizing with lobster rolls in select restaurants in the New England states. Then they tested chorizo burritos in Texas (and other markets), and tofu and fish McNuggets in China. The approach was successful enough that it prompted McDonald’s to build their “experience of the future.” This ongoing venture includes using localized ingredients and menu items, and listening to what their consumers want via the brand’s global mobile app. The Great Harvest Bread Company has over 200 independently owned stores, but an important part of their brand experience is that no two bakeries are alike. Customers will find unique menu items depending upon where they visit. Each bakery features the brand’s top-quality wheat, but customization is rampant. Great Harvest leverages their marketing campaigns market by market. Their “store-up” strategy puts local first. Coca-Cola localized to the first names of their customers. You’ve likely seen their bottles featuring the phrase “Share a Coke with…” (Fill in any name after that.) They even catered to different countries. For instance, in Ireland they added names like Aoife and Oisín. Of course, if you can’t find your name on a bottle, you can go online and order personalized bottles or six-packs. Musicians and entertainers are even getting in on localization. Rather than merely showing up for a gig, bands work with local promoters to speak to regional audiences. This helps generate interest and sell tickets. California-based rock band Switchfoot records brief Facebook videos to let fans know there’s an upcoming show in their area. They announce the time and date, but they also work with each show’s promoters to inject specific language that speaks to the local audience. For instance, to promote their Pittsburgh show, they used the word Yinz, a localization of the word you, or you all. Productivity, or the lack of it, is a major factor affecting online brand management. How productive are your marketing initiatives? Do you find yourself spinning your wheels by searching for brand assets and sending emails back and forth with local marketers? A brand management solution can help you be more productive. Consider this less-than-desirable scenario that’s costing your brand countless lost hours. Let’s say your franchise marketing efforts rely on you to update each local marketer individually with brand assets. Depending on how many franchisees you’re dealing with, that’s going to take up a chunk of your time. If you’re sending one email with the same attachments on all of them, you’ve already abandoned the idea of localizing your brand. That’s because each one is getting the same marketing materials, which may not be suitable for their local market. You can see how this could quickly spiral out of control. The next thing you know, you’re responding to those emails you sent, answering questions, or fulfilling more requests for additional materials. This is a situation you don’t want to deal with. With an online brand management solution, you’re creating an atmosphere of productivity. You’re providing user-customizable collateral templates, a digital asset management system, plus brand guidelines and information resources all in one convenient location. Are your local marketers clamoring for more freedom? When you have marketing collateral that’s easy to produce via online brand management, your distributed workforce can respond to their local needs without requesting the same materials over and over. Customized templates empower them to create their brand-approved marketing materials quickly and easily. 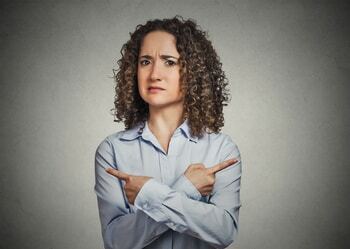 Are Your Marketing Materials Lost in Translation? If you’re entering a market with a different language, be very careful. Your slogans, messaging—even your brand name—all come into question. Take the time to make certain your translation is correct. Some big brands weren’t so fortunate. Nokia tried to sell their Lumia phone in some Spanish-speaking countries. The problem? Lumia is a slang term for prostitute in Spanish. Kentucky Fried Chicken’s “Finger Lickin’ Good” slogan was incorrectly translated to read “Eat Your Fingers Off” in China. Can you accurately translate your marketing materials to another language with the click of a button? It’s a particularly effective solution when your local marketers need to produce materials for non-English speaking customers. A brand management solution allows you to supply approved translations that speak to local customers. Are all your digital assets in one place for authorized users to access or are you still searching through files and sending them via email? 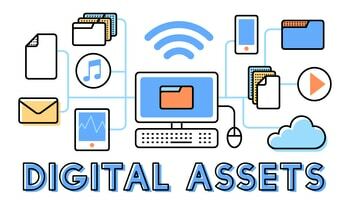 An online brand management system can help organize your marketing assets with digital asset management (DAM) software. An effective brand management system features DAM software. This creates an online headquarters for all your marketing assets so your authorized users can quickly access the resources they need. This could be brand photos and graphics, videos, logos, or any other digital files you want to make readily available. Your digital assets are no longer in disarray. In fact, they’re very organized. Let’s say your graphics team created a new logo and you want to get it to your local marketers along with its usage guidelines. The logo is available in approved image formats, like a JPG, PNG, and TIF. You converted the guidelines from a Word document into a PDF. There’s no need to attach these files to an email. All you have to do is upload them to your online brand management center. In an instant, everyone has immediate access. To further demonstrate the order and simplicity of this system, let’s say one of the files needs an update. Rather than making the edit and emailing that file again, you can simply re-upload it to the brand management center. The new file will automatically replace the old and you’re good to go. Do you have the tools you need to automate your marketing campaigns? You can automate and distribute any ongoing or repeating communication with online brand management. Whatever channel you choose—print, email, SMS, or social channels—you can automate all of them with a brand management solution. Almost 80% of top-performing companies have been utilizing marketing automation for at least three years. You should too. Let’s take a look at an example of an automated marketing campaign for improved online brand management. Imagine you’re a mortgage lender and you have a discussion with a customer who’s interested in a home loan. After meeting with them, you enter their information into your CRM system and label them to receive ongoing emails as part of an automated follow-up campaign. Businesses who nurture leads in this fashion make 50% more and spend 33% less than prospects who aren’t nurtured. You’re going to send this prospect additional follow-up information via direct mail and email. You can tailor the messages to your discussion with them. Each applicant will be slightly different, based on their credit score, the type of loan they’re looking for, etc. By personalizing your communications with them, however, you’re increasing your chances of getting your marketing message read. Even when the customer shows an obvious interest or requests information from you, personalization increases your chances of success. Your automated campaign may include a letter from the loan officer, two timed emails (the second is only sent if there’s no response to the first), and a direct mail postcard, all within a two-week time period from their initial interaction. This is one way to conduct an automated campaign, but there are many possibilities and variations when you take a multichannel marketing approach. Your marketing strategy relies on your data. 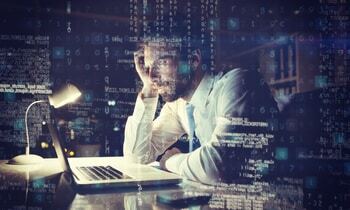 If you have dreadful data—duplicate contacts, incompatible formatting, or one instance of broken code—it will negatively impact your marketing efforts. API integration affects online brand management by providing clean data and measurable results. Let’s go back to the home loan example. Remember, you’re creating an automated marketing campaign for prospective customers. After gathering their information, you need to make sure their data is clean. Take the customer’s name and address, email address, the type of loan they’re interested in, and their credit score. Let’s also include the bank branch they visited and the representative they spoke with. Before sending any campaign, you can verify and clean the data. Thus, in this instance you can remove any prospect whose credit score is too low because they don’t qualify. This assures that the bank doesn’t spend part of their budget marketing to candidates who aren’t qualified. By using online brand management software, you’ve created a customized validation routine for each prospect. This ensures all your data is clean and ready for production. As your business grows, your data grows with it. You have more products and services to sell and you’re making more money. These are good things, but your brand management solution needs to grow along with it. A scalable software solution that’s built into your API infrastructure allows your brand to naturally evolve and adapt. You can also add more authorized users to the system without worrying about overworking your design team. You can protect your brand’s identity, manage your brand’s assets, and improve your marketing ROI with online brand management. As you address the factors that affect your brand, you’ll solve your marketing problems and position your brand for success. 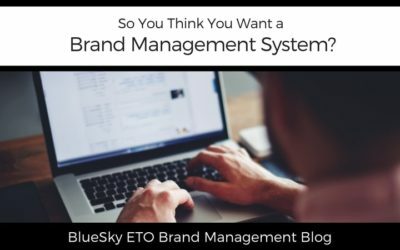 BlueSky ETO offers a complete brand management solution that’s engineered to order for your organization. Your software will differ from the software another brand uses. That’s because it’s built specifically for your brand’s needs. Let us work with you to develop a solution that conforms with your current systems. We’ll ask you specific questions to help us create a customized, scalable brand management system. Contact us to schedule a free brand consultation. Need Help With Your Brand Strategy? Online brand management helps protect your brand's identity, manage assets, and improve marketing ROI. Here are seven factors that affect it. Just what you need, have been on my mind lately..this is relly helpful, thanks for sharing! Thisbwas just the perfect post for me to read and learn from as i intend starting up a business soon and i have learnt that online branding and awareness is key… Thanks for the key points. I kinda like McDonald’s strategy of localizing their products. I had the chance to try their localized burgers/food on my previous trips and it made their menu more interesting, tbh. Great content, branding is really important. Thanks for the insights that you shared. It’s really helpful. What great insights about brand management. Branding is really important on our business. Marketing to the locals can be an interesting approach, but it’s not an easy one. Always seek help. let’s talk about how this post is a true gold mine. you bring up excellent points that sadly a lot of companies big and small overlook. i’m most def saving this post to make sure i’m not falling into any of these traps. It’s interesting to see how much is lost in translation. I’m a bit surprised that big companies like Starbucks make these mistakes. This article was very informative. It helped enhance my understanding of the importance of branding.I am going to utilize your tips to create my strategy plan. Baranding is an important part of business but nost of the time it is very crucial. Thank you for giving us isights on how to manage it. Such a useful information. This was seriously such a great read! I love all of the info you gave and how easy it was to follow 🙂 I just started my own website so this will be super helpful to me! This is such a good read for me as I just started my website and I seriously need to look at the branding part. These are great factors and very informative for those who need brand management help! Branding is crucial for business and I think many small businesses lack this. These are amazing tips. These are some great tips for people looking to improve their branding to sell their product. Thanks for sharing. Great tips and information concerning the effects of brand management. I will use these tips to help improve our brand. I still remember I started blogging since 2014 but I haven’t manage to keep the domain and all because of this identity crisis for my blog. I can’t find the right niche and I write anything which is a disaster in creating my own brand. You are totally right about this! Thank you for the helpful tips. Will keep in mind as we need this kind of info to remind us time after time. You’ve given me so much to think about related to brand management. I have no doubt that if I put these 7 strategies to work I can find greater success. So many great points here presented in a logical and easy to digest way. It’s so true that inconsistency of brand positioning/communication in the marketplace leads to distrust and loss of revenue. Had a good laugh at the ‘lost in translation’ examples you included – that really did make that point rather well! What a wonderful read! I thoroughly enjoyed this and learned so much. I agree, coming up with marketing that will give you a genuine ROI is the best way create a “strategy plan”. 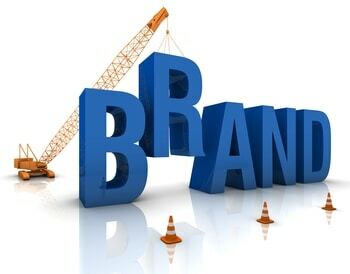 This article seems to be very thorough on what is needed to ensure successful branding. There is just so mucg work and time invoved so commitment is definitely key. Very well thought out. I agree on the steps to branding yourself or product.